Sorry about the missed blog on the holiday. Intending to write, I just couldn’t keep focused. My mom broke her hip on Sunday and although I can typically write through thick and thin, my mom’s surgery was my only focus. We are a bit connected at the hip so I may as well have been sedated throughout the process. But moving forward with my garden analogy; this situation is similar to a tree bough breaking in the midst of a winter ice storm. Trees can handle a few missing branches but when something major impacts its structural stability, immediate attention is required. Although my mom has a bit of age on her, she is still a prize tree. Even the Doc said he was working with strong bones. With a successful surgery, the long haul of getting back on track is scheduled for everyone’s agenda over the next few months. 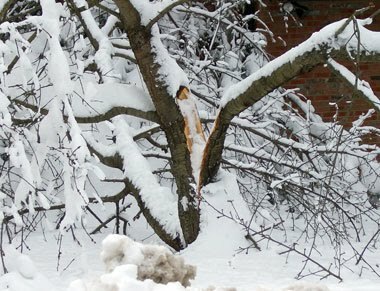 So take care of your trees this winter. Pay attention to any severe snow, ice or wind damage. Remember to call in the experts when you determine it’s a major break and be patient. The healing process can be a tad long but there can still be a lot more longevity in those limbs. John Henry Jowett sums up the purpose of a tree and our lives best. “May my life be like a great hospitable tree, and may weary wanderers find in me a rest.” My mom still has many a bowl of pasta and meatballs to share with her family. Image of damaged tree from the Internet.